To understand how DNA is used to build life, you have to appreciate the chemical properties of DNA, the physics that determine a protein’s shape, and how both of these influence the way an organism behaves in its environment. A good example of this multidisciplinary approach can be found in the work of renowned physicist Dr. Herman Branson, who helped discover a pivotal protein structure called the alpha helix. Using his knowledge of physics, Dr. Branson made significant contributions to our understanding of how proteins work and how they contribute to diseases like sickle cell anemia. In essence, your DNA is a long chain of molecules that spells out instructions for building proteins, which are each built by our body to perform a certain function. There are thousands of different proteins in the human body, which are all constructed from amino acids linked end-to-end in a specific order determined by your DNA. These amino acid chains will naturally fold into superstructures based on the chemical and physical properties of the amino acids. This superstructure determines a protein’s function. Until the 1940s, very little was known about the superstructure of proteins. Scientists had only just begun using X-ray crystallography to try to discern the molecular shape of biomolecules like proteins and DNA1,2. In the late 1940s, Dr. Herman Branson and his colleagues Dr. Linus Pauling and Dr. Robert Corey would made a breakthrough discovery when they accurately described the alpha helix protein structure, which is present in numerous proteins1,2. This structure is a critical part of many proteins that help read the DNA. It also helps hemoglobin proteins carry oxygen through the blood. Prior to the discovery by Branson and his colleagues, there were hints that proteins contained this structure, but no one had yet figured out the molecular configuration of it. Dr. Branson received his PhD in physics from the University of Cincinnati in 1939, and was well equipped to help Pauling and Corey crack the puzzle1. 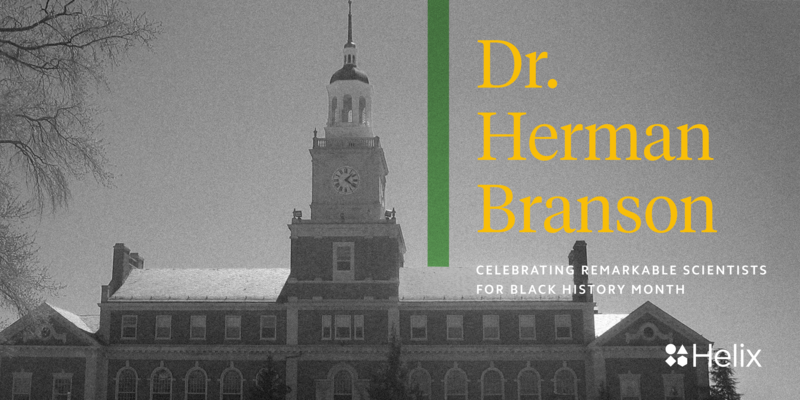 The discovery of the alpha helix was early in Dr. Branson’s career, and he would spend most of his time researching and teaching at Howard University. In his tenure, he published numerous papers on the molecular properties of Sickle cell disease3—a group of conditions in which the superstructure of the hemoglobin protein is distorted in a way that causes red blood cells to be shaped like sickles. By many accounts, the achievements of Dr. Branson extended far beyond the lab. He was a powerful advocate for historically black colleges and aided numerous young African American researchers in their careers (including Dr. Marie Maynard Daly). His success demonstrates the value in overcoming the perceived limits of labels and categories, both academically and socially. 1Eisenberg, David. “The Discovery of the Α-Helix and Β-Sheet, the Principal Structural Features of Proteins.” Proceedings of the National Academy of Sciences of the United States of America 100.20 (2003): 11207–11210. PMC. Web. 23 Feb. 2018. 3Peck, Frederick, and Herman Branson. “Studies of Sickle Cell Anemia: II.” Journal of the National Medical Association 50.1 (1958): 25–26. Print.